This puckery lactose-free sharp cheddar is bright and nuanced. Hints of grapefruit and bergamot give it interesting back-notes. The texture is ever so crumbly but still quite creamy. You may notice it gets even creamier as it warms to tasting temperature. If you can resist it for that long! Slice it and savor its more delicate notes with a cup of Earl Grey tea or pair with candied citrus peel. Or just go for it: shred it and generously top off a bowl of spicy chili. Store wrapped tightly in the refrigerator. Oh my goodness, never expected such richness. Very smooth and creamy, and so good! 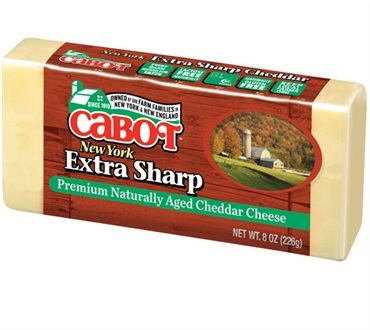 I just love it, and have tried many of Cabot's cheeses purchased online. Our local super markets carry the basics, but very limited variety. It is so worth ordering an assortment....a treat for the palate. Great on crackers and burgers! Absolutely best sharp cheese available! Love to cook, and use only the best ingredients in my recipes.